Last week Rice lost two stalwart alumni, Joyce Pounds Hardy ’45 and Gus Schill ’55. Both remained deeply involved with Rice for their entire lives, reliably reporting for duty and serving the university in multiple capacities. Both were class chairman for the annual fund several times, both served on the Rice Board as Alumni Trustees, both did terms as ARA president, Joyce being the first woman elected to that post. Gus Schill went to UT Law School after he left Rice and had a long career at the prominent admiralty law firm of Royston, Rayzor while also teaching for many years at the University of Houston Law School. His contributions to the university were wide ranging but probably the most important was his service on the search committee that brought George Rupp to Rice as our fifth president. This search, headed by Ralph O’Connor, was the first formal presidential search Rice did after the disastrous Masterson Crisis and was so well run that it became the model for all the searches that have followed. Gus loved Rice and had strong opinions about it. He was generous with his time and committed to doing whatever he could to help each new generation of students. I loved listening to him talk, even when we occasionally disagreed (which he could do with gusto). 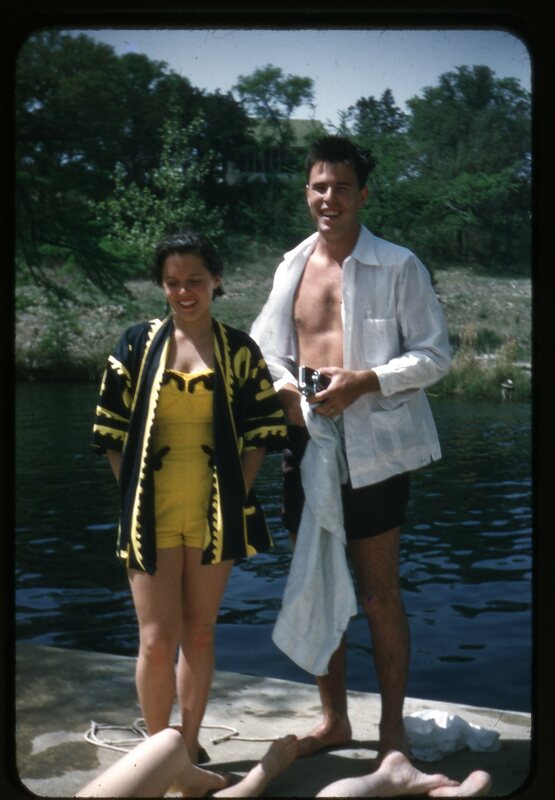 The photo below was taken by his classmate J. Fred Duckett ’55 and I’d guess it must have been taken right around the end of their senior year. Gus Schill, rest in peace. 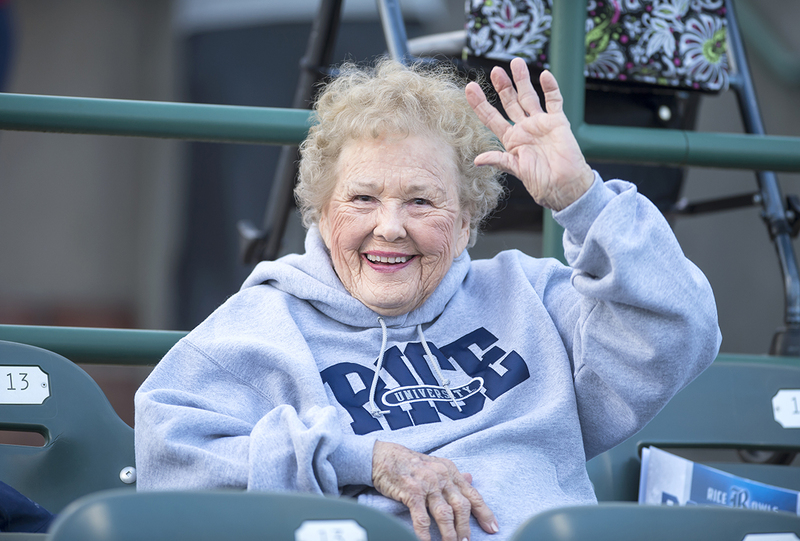 Joyce Pounds Hardy enthusiastically embraced a wide range of activities at Rice but she’s probably best remembered as a passionate supporter of both men’s and women’s athletics. She herself was an athlete here, back in the days when women’s sports were only intramural. She was energetic and fun-loving, relentlessly positive, and joyful in her appreciation of a game well played and the young people who played it. She also put her money where her mouth was. Her consistent hard work on behalf of her beloved Owls resulted in many, many improvements to our athletic facilities over the years as she spearheaded one fundraising effort after another. This devotion won her the Honorary R Award in 1980 and the Distinguished R in 1990. Joyce Pounds Hardy, rest in peace. Joyce was Rice’s “Sister Jean”. Her compassion and love for the university will be a institutional memory that will burn brightly for years. A fond farewell to the “Bubblegum Lady”. I am totally confused by the reference to Baker College, which did not exist until 1956. Perhaps you should have said “East Hall” instead.